I woke up this morning to the rain and grey and decided it was time to make rainbow soup. I woke up this morning to the rain and grey and decided to make zucchini soba. Does that sound classier? I made stock last week (out of pork neck bones and chicken wings) and it resulted in a rich and gelatinous stock. I’ve been sipping it like a healing beverage all week, but now I could put it towards a loftier use. I spiralized my zucchini, julienned the ginger, and sliced the scallions and radishes thinly. I scissored the seaweed into thin strips and soft boiled an egg (what’s better than a soft-boiled egg?). A soft boiled egg is an egg that’s gently placed in boiling water for 6 minutes and 30 seconds. Immediately drain and run under cold water. Let the egg sit under cold water until ready to use. Over medium-high heat, add about 3 teaspoons of coconut oil to a pan, and once melted, add the shiitakes. Make sure the mushrooms are all in contact with the pan so they can brown. Don’t touch the mushrooms and let them cook for 1-2 minutes. Once they’ve started to brown, shake the pan and then add the broccoli. I add about 3-4 dashes of the mushroom soy sauce, which is enough to season everything and add a bit of steam to the pan to help cook the broccoli. If the pan smokes too much, turn the heat down. The veggies take about 5-6 minutes total. Once they’re cooked, remove from the pan so they stop cooking. Bring the stock up to a simmer and adjust seasoning. I like to add a few dashes of the mushroom soy sauce as well, about 2-3 teaspoons, and some black vinegar, about a teaspoon. Both these ingredients can be found in an Asian grocery store. Season to taste. Drop the zucchini noodles in the simmering stock. This is a pretty quick process and you don’t want to overcook the noodles. Keep the stock at a gentle simmer. Do not let it boil. It takes about 2-3 minutes for the zucchini to become tender, and the noodles will soften a little more even after you take the pot off the heat.You can peel the egg while the noodles cook, then carefully cut it in half. Pour the noodles and soup into a bowl. 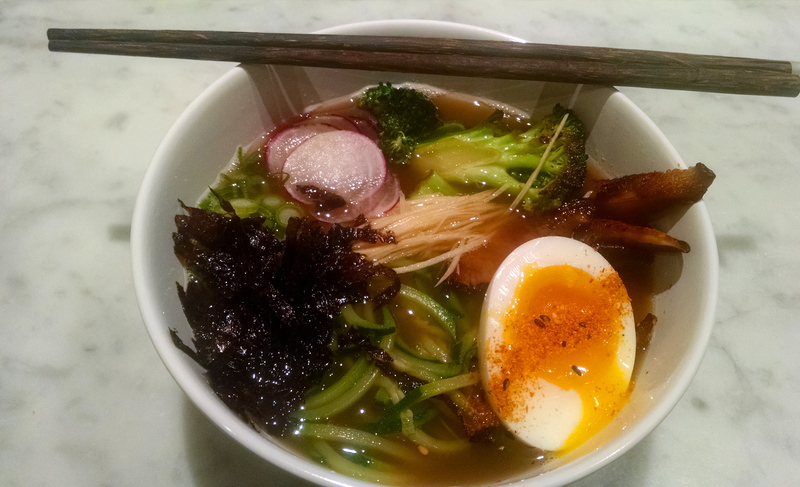 Add all the garnishes: ginger, radish, scallion, seaweed, mushrooms, broccoli and egg. I dash Togarashi, a Japanese chili condiment, over the whole bowl.